It has been suggested by some that taste-bud choirs break into stirring renditions of the "Hallelujah Chorus" the first time they are introduced to this fabulous sauce. The undisputed star of this show is the preserved lemons, (think lemons on steroids). Hopefully, they are organic lemons that have been pickled in salt and their own juices and left to sit for at least two months before using. The preserving process tempers the tartness and accentuates the lemon flavor. Homemade preserved lemons make great Holiday gifts. Start them this month so they are December ready. 1. To make the marinade, combine the olive oil, garlic, ginger, cumin, turmeric, salt and pepper. Place the chicken in a large Ziploc bag and pour the marinade over. Swish around to ensure the chicken is thoroughly coated. Let marinate for at least 4 hours or overnight for maximum flavor. Massage the bag of chicken occasionally while marinating to assure consistent flavor in every piece of chicken. 2. Heat 2 tablespoons olive oil in a skillet, Dutch oven, or Ninja cooker over medium high heat. Cook the onions until soft and translucent, 5 to 7 minutes. Add the chicken and cook just until it turns white, about 2 minutes on each side. Add the broth and any remaining marinade from the Ziploc bag. Bring it to a boil. Reduce the heat to low, cover and simmer for no more than 20 minutes, turning the chicken over once after 10 minutes. 3. Add the preserved lemon, parsley, cilantro and olives, stir to incorporate into the sauce, cover and simmer for another 10 to 15 minutes. Stir in the lemon juice and add salt to taste if needed. Do not overcook! Serve immediately. We highly recommend doubling this recipe for leftovers. We served our preserved lemon chicken over rainbow quinoa, which includes six grams of protein in each serving. Preserved lemons are a great source of digestive probiotics and they include large amounts of vitamin C. In Ayurvedic cuisine (a type of alternative medicine) preserved lemon pickle is a home remedy for stomach disorders and its value is said to increase as it matures. Most every culture across the globe enjoys an assortment of digestive pickled foods, with preserved pickled lemons being one of the most popular fruits used for keeping the digestive system healthy. If you have no interest in preserving your own lemons, they can be purchased from Amazon or from your local international food store. 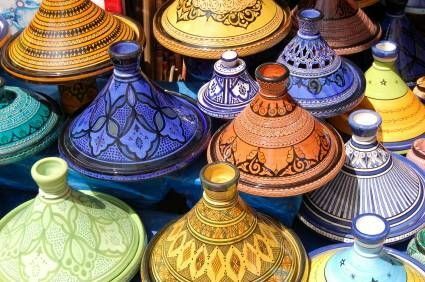 While you are on Amazon you might want to think about purchasing a tagine, since you will probably find yourself obsessing dinner-party-good Moroccan food once you are in possession of preserved lemons. We usually make preserved lemon chicken in a Ninja 3 in 1 cooker, but serving it in a beautiful Moroccan tagine really appeals to us.